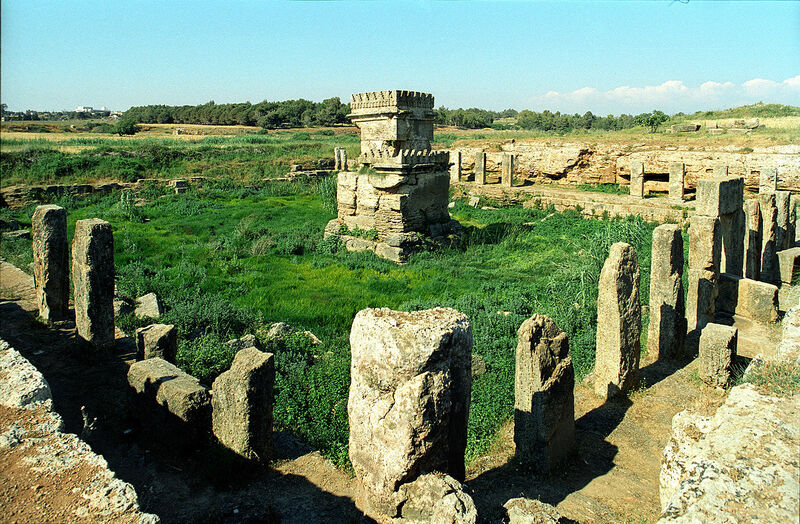 The site of Amrith is located on the Syrian coast 6 km south of the modern city of Tartous. Previous occupation from the end of the 3rd millennium B.C. has been identified on the tell (mound) but Amrith is first of all known as a typical site of the Phoenician period in Syria. 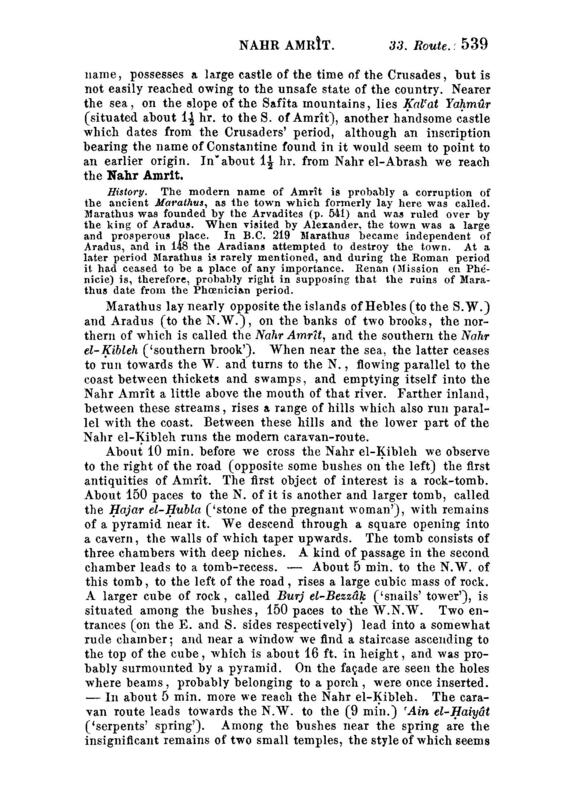 The site is believed to be a continental suburb of the city of Aradus on the neighboring fortress island, which today is called Arwad. The great extent of the site and the variety of its archaeological structures clearly show that Amrith was a flourishing city and may have had an important commercial role. History --- The modern name of Amrit is probably a corruption of the ancient Marathus, as the town which formerly lay here was called. Marathus was founded by the Arvadites (p. 541) and was ruled over by the king of Aradus. When visited by Alexander the town was a large and prosperous place. In B.C. 219 Marathus became independent of Aradus and in 148 the Aradians attempted to destroy the town. At a later period Marathus is rarely mentioned and during the Roman period it had ceased to be a place of any importance. Renan [in his 1864 book] Mission De Phénicie is therefore probably right in supposing that the ruins of Marathus date from the Phoenician period. Marathus lay nearly opposite the islands of Hebles (to the S.W.) and Aradus (to the N.W.) on the banks of two brooks, the northern of which is called the Nahr Amrit and the southern the Nahr el-Kibleh ('southern brook'). When near the sea the latter ceases to run towards the W. and turns to the N., flowing parallel to the coast between thickets and swamps and emptying itself into the Nahr Amrit a little above the mouth of that river. Farther inland, between these streams, rises a range of hills which also run parallel with the coast. Between these hills and the lower part of the Nahr el-Kibleh runs the modern caravan-route. About 10 minutes before we cross the Nahr el-Kibleh we observe to the right of the road (opposite some bushes on the left) the first antiquities of Amrit. The first object of interest is a rock-tomb. About 150 paces to the N. of it is another and larger tomb called the Hajar el-Hubla ('stone of the pregnant woman') with remains of a pyramid near it. We descend through a square opening into a cavern, the walls of which taper upwards. The tomb consists of three chambers with deep niches. A kind of passage in the second chamber leads to a tomb-recess. — About 5 min. to the N.W. of this tomb, to the left of the road, rises a large cubic mass of rock. A larger cube of rock called Burj el-Bezzak ('snails tower'), is situated among the bushes 150 paces to the W.N.W. 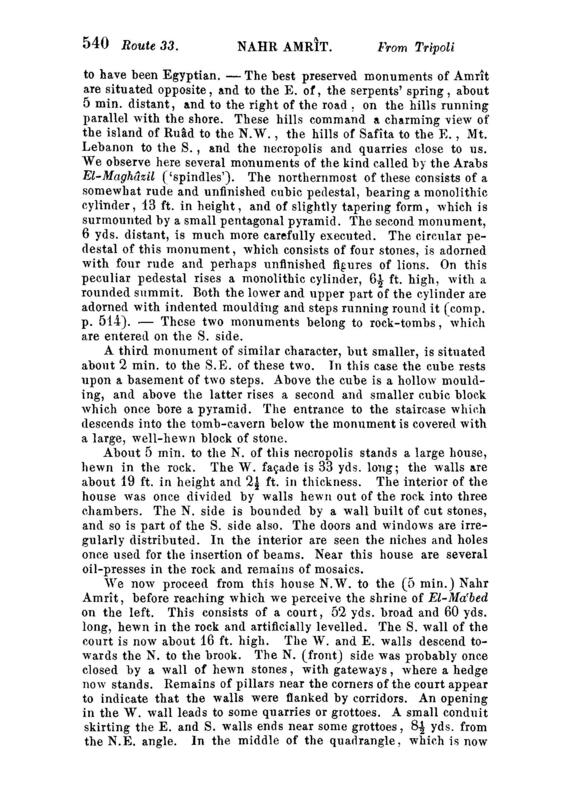 Two entrances (on the E. and S. sides respectively) lead into a somewhat rude chamber; and near a window we find a staircase ascending to the top of the cube which is about 16 ft. in height and was probably surmounted by a pyramid. On the facade are seen the holes where beams, probably belonging to a porch, were once inserted. — In about 5 min. more we reach the Nahr el-Kibleh. The caravan route leads towards the N.W. to the (9 min.) 'Ain el-Haiyat ('serpents spring'). Among the bushes near the spring are the insignificant remains of two small temples, the style of which seems to have been Egyptian. — The best preserved monuments of Amrit are situated opposite and to the E. of the serpents spring which is about 5 min. distant and to the right of the road on the hills running parallel with the shore. These hills command a charming view of the island of Ruad to the N.W., the hills of Safita to the E., Mt. Lebanon to the S., and the necropolis and quarries close to us. 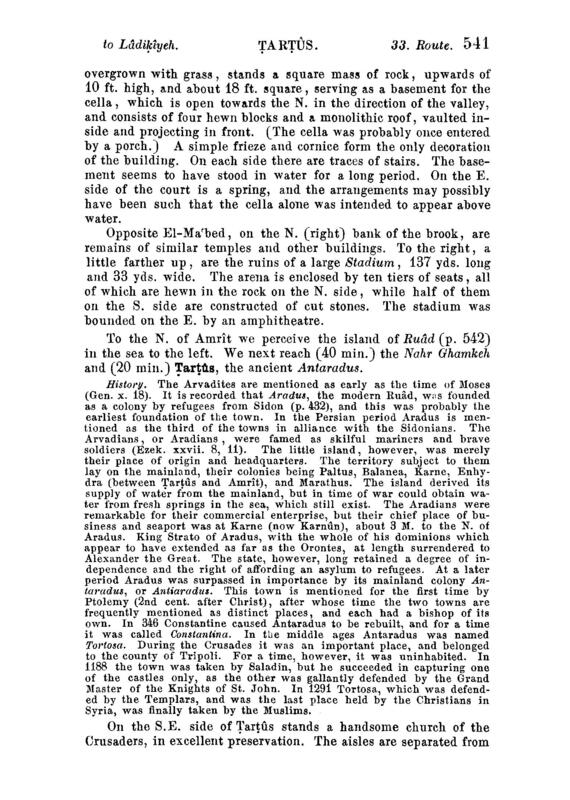 We observe here several monuments of the kind called by the Arabs El-Maghazil ('spindles'). 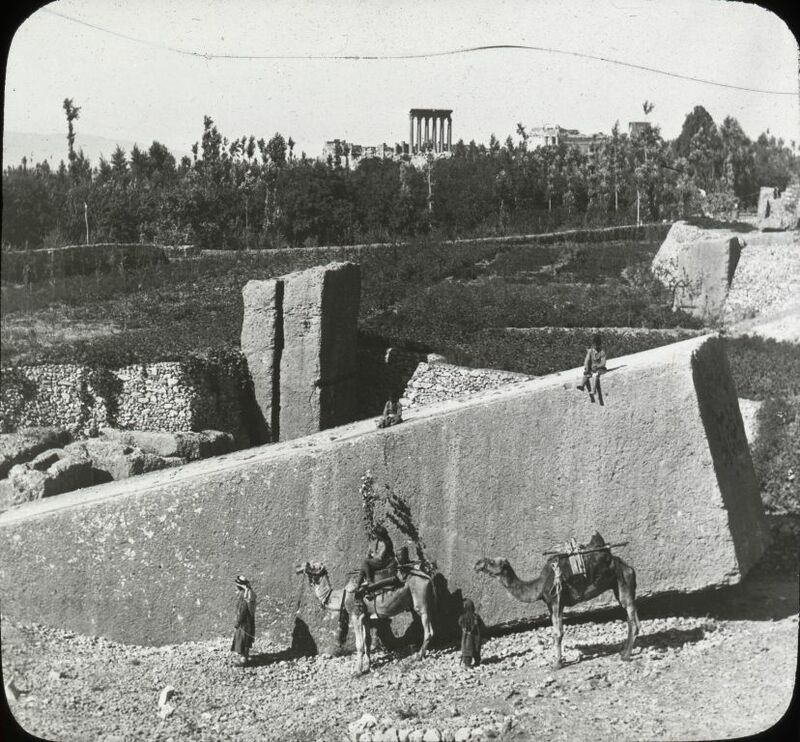 The northernmost of these consists of a somewhat rude and unfinished cubic pedestal bearing a monolithic cylinder 13 ft. in height and of slightly tapering form, which is surmounted by a small pentagonal pyramid. The second monument, 6 yds. distant, is much more carefully executed. The circular pedestal of this monument, which consists of four stones, is adorned with four rude and perhaps unfinished figures of lions. On this peculiar pedestal rises a monolithic cylinder 6 1/2 ft. high with a rounded summit. Both the lower and upper part of the cylinder are adorned with indented moulding and steps running round it (comp. p. 514). — These two monuments belong to rock-tombs which are entered on the S. side. A third monument of similar character but smaller is situated about 2 min. to the S.E. of these two. In this case the cube rests upon a basement of two steps. Above the cube is a hollow moulding and above the latter rises a second and smaller cubic block which once bore a pyramid. The entrance to the staircase which descends into the tomb-cavern below the monument is covered with a large well-hewn block of stone. About 5 min. to the N. of this necropolis stands a large house hewn in the rock. The W. facade is 33 yds. long; the walls are about 19 ft. in height and 2 1/2 ft. in thickness. The interior of the house was once divided by walls hewn out of the rock into three chambers. The N. side is bounded by a wall built of cut stones and so is part of the S. side also. The doors and windows are irregularly distributed. In the interior are seen the niches and holes once used for the insertion of beams. Near this house are several oil-presses in the rock and remains of mosaics. We now proceed from this house N.W. to the (5 min.) Nahr Amrit, before reaching which we perceive the shrine of El-Ma'bed on the left. This consists of a court, 52 yds. broad and 60 yds. long, hewn in the rock and artificially levelled. The S. wall of the court is now about 16 ft. high. The W. and E. walls descend towards the N. to the brook. The N. (front) side was probably once closed by a wall of hewn stones with gateways where a hedge now stands. Remains of pillars near the corners of the court appear to indicate that the walls were flanked by corridors. An opening in the W. wall leads to some quarries or grottoes. A small conduit skirting the E. and S. walls ends near some grottoes 8 1/2 yds. from the N.E. angle. In the middle of the quadrangle, which is now overgrown with grass, stands a square mass of rock upwards of 10 ft. high and about 18 ft. square serving as a basement for the cella which is open towards the N. in the direction of the valley and consists of four hewn blocks and a monolithic roof vaulted inside and projecting in front. (The cella was probably once entered by a porch). A simple frieze and cornice form the only decoration of the building. On each side there are traces of stairs. The basement seems to have stood in water for a long period. On the E. side of the court is a spring and the arrangements may possibly have been such that the cella alone was intended to appear above water. Opposite El-Ma'bed on the N. (right) bank of the brook are remains of similar temples and other buildings. To the right a little farther up are the ruins of a large Stadium 137 yds. long and 33 yds. wide. The arena is enclosed by ten tiers of seats all of which are hewn in the rock on the N. side while half of them on the S. side are constructed of cut stones. The stadium was bounded on the E. by an amphitheatre.